Chaplains evacuate wounded with the 3rd Canadian Infantry Division, Caen, France, 15 July 1944. Notice the maple leaf marking below the jeep’s windscreen. Photo courtesy of DND / LAC / PA-130175. Canadians celebrated Dominion Day on July 1st during the Second World War. The Canadian government only changed the holiday to Canada Day in 1982. Dominion Day in 1944 was also only 25 days after D-Day; Canadian troops of the 3rd Canadian Infantry Division, 2nd Canadian Armoured Brigade, and 1st Canadian Parachute Battalion had been fighting in Normandy for nearly a month. The first two formations had breached the Atlantic Wall at Juno Beach, driven further inland than any other Allied formation, and stopped the only serious chance the Germans had to throw the Allies back into the sea. By late June and early July, the Canadians were holding their hard-won gains and preparing for the final push on the Norman city of Caen. But how did Canadian soldiers in the field recognize Canada’s national day? A survey of Canadian Army war diaries and other sources offers a glimpse at how that day was marked in 1944. 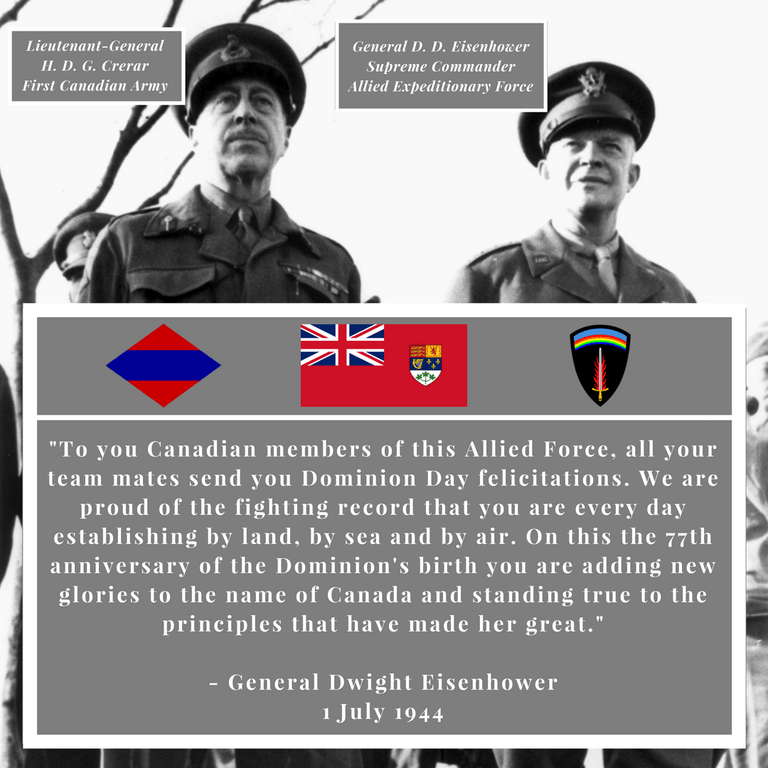 General Dwight Eisenhower, Supreme Commander of all Allied forces in northwest Europe, was an excellent international commander. He recognized the distinct Canadian contribution to the campaign and cabled the following to his army, navy, and air force deputies. Canadian Prime Minister W. L. Mackenzie King sent his own Dominion Day message but no other senior Allied (Canadian or otherwise) military officer sent one. First Canadian Army and II Canadian Corps were not yet active in Normandy. Instead, the Canadians were part of Second British Army. It wasn’t until July 11th that Lieutenant-General Guy Simonds established II Canadian Corps in Normandy. First Canadian Army (under Lieutenant-General H. D. G. Crerar) followed nearly two weeks later. So, when Eisenhower sent this cable, he sent it to the headquarters of various British officers. In Fields of Fire, Terry Copp notes that an “official hesitancy in promoting a separate Canadian identity was evident in the army’s low-key approach to … Dominion Day.” Eisenhower’s message went to General Bernard Montgomery’s 21st Army Group headquarters, but it is unclear how widely it was distributed beyond this. At least one unit received the message. The Canadian Scottish Regiment from Victoria received both messages (from Mackenzie King and Eisenhower) but reported no Dominion Day celebrations. The Regina Rifles Regiment war diarist quipped, “Dominion Day celebrated by more digging. No problem in getting men to dig. The problem is to keep people from digging out of sight.” The regiment, which had stood so resolutely against German counter-attacks around Bretteville-l’Orgueilleuse, was being subjected to continuous German shelling from which there was little relief. Elsewhere on the Canadian perimeter, the North Nova Scotia Highlanders spent the dreary, overcast day under fire: “Area very quiet today — Jerry is throwing the occasional shell and mortar round to keep the boys mentally alert.” There was no mention of Dominion Day. The Sherbrooke Fusiliers Regiment war diarist noted, “Dominion Day still found the unit on high ground making good use of every moment to improve its battleworthiness. The day was only marked by a rum issue [to the troops].” Another armoured unit, the Fort Garry Horse (Winnipeg), simply noted that July 1st passed quietly. The war diarist of the Queen’s Own Rifles (Toronto) didn’t mention Dominion Day in his entry for July 1st. Nor did the diarists of the Royal Winnipeg Rifles, the 1st Hussars (London, Ontario), the Stormont, Dundas and Glengarry Highlanders (eastern Ontario), the Régiment de la Chaudière, and the North Shore (New Brunswick) Regiment. The lack of Dominion Day celebrations in Normandy stood in stark contrast to how the day was marked in 1941. Back then, the Canadian Army was building its strength in Great Britain. The men needed opportunities like Dominion Day to break up the monotony of training and exercises in the English countryside. James Barker, a soldier in the Princess Patricia’s Canadian Light Infantry, wrote to his mother about the Dominion Day sports event held in Redhill, Surrey: “It was a grand day and positively the biggest crowd I have seen in England was there. There must have been 5 or 6000 people there. The whole Canadian Corp. was represented and civilians were admitted free.” King George VI even made an appearance, letting out a cheer when his favoured team won the tug-of-war. The war diary entries for Dominion Day 1944 show that the holiday didn’t stand out to most of the Canadian regiments in Normandy. Perhaps the tendency to downplay the unique identity of Canadian soldiers in Normandy took hold. Or maybe our soldiers were simply too busy with the stresses of the frontline to celebrate the occasion. Canada Day may be a statutory holiday today, but Dominion Day was just another day in the middle of a long and bloody campaign for the men and women of Canada’s armed forces in 1944.